The Tallahassee mayor overcame a crowded field and a funding disadvantage to emerge as the Democratic nominee for governor. TALLAHASSEE —When Tallahassee Mayor Andrew Gillum voted for himself for governor in the Democratic primary Tuesday morning in a quiet church on the north side of the city, he had a message for the doubters who had said the progressive candidate could not win the state's Democratic base. "I think we're going to surprise a lot of people this evening," he told reporters after he walked out of the polling booth. Andrew Gillum, in a nail-biting, contentious primary that was expected to be former U.S. Rep. Gwen Graham's to lose, will now face Republican U.S. Rep. Ron DeSantis in an ideological showdown guaranteed to put the state's gubernatorial race — already a marquee contest — in the national spotlight. But DeSantis, who trounced the once-anointed Republican favorite, Agriculture Commissioner Adam Putnam, won the race off the strength of the one endorsement that mattered: President Donald Trump's. Gillum, in defeating Graham, faced several headwinds in his race to lead the state party ticket: a slow-winding FBI investigation into corruption in his City Hall (which he has denied being a target of), a significant funding disadvantage compared to the three millionaires and billionaire he was competing against. But in a late push to bring voters to the polls, Gillum proved — as he has in every election since he first became a city commissioner in Tallahassee at age 23 — that he could "bring it home," as he said repeatedly in the final weeks of the primary. 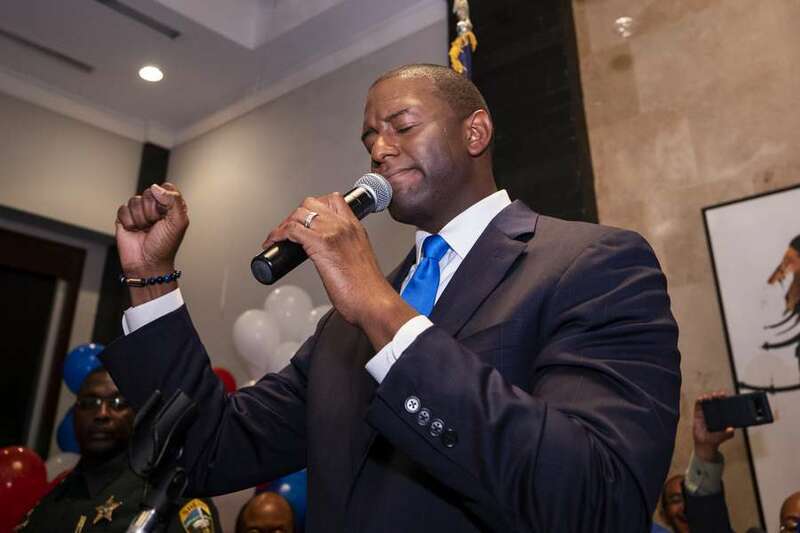 Gillum bounced around the state for months, campaigning in black churches and on the trail in a bid to activate young voters and the state's African-American base, which comprises about a fourth of the Florida Democratic Party. And in the last days of the race, Gillum only doubled down further, traveling to South Florida to turn out "souls to the polls" on Sunday and asking people to give the 39-year-old, brashly liberal mayor a chance. After he voted Tuesday morning, he projected confidence it had all paid off in a late, 11th-hour "surge," despite polling that still suggested he would lose that night. "Four, five weeks ago, all y'all's polls had us fifth. Then we were fourth, then we were third, now we're second," he said. "Today, I think we're going to close in first." At the upscale Hotel Duval in downtown Tallahassee, where supporters gathered hoping to outperform those polls, the mood slowly turned from cautious hope to shock to unbridled, ecstatic joy as Gillum over-performed in the liberal stronghold of Broward County and eventually won the state. As MSNBC showed Gillum pulling even with Graham, then Graham falling behind, supporters began to shout, in deafening, rolling waves. When the Associated Press called the race for Gillum at 9:20 p.m., the room broke out into cheers. But when MSNBC on the screen showed Gillum's face as the projected winner, the mass of people crowded into the ballroom became a single roar. Gilllum's City Hall aide, Jamie Van Pelt, began hugging everyone he could. They restocked ice at the bar. Geoff Burgan, the campaign's spokesman, began shouting the campaign's now-prophetic closing slogan again, which the room took up: "Bring it home! Bring it home! Bring it home!" Another chant also broke out: "Do we believe in polls?" "No!" When Gillum walked out just after 9:30 p.m. to his signature campaign walk-on song, Migos' Walk It Talk It, supporters raised their smartphones and their signs to mark the historic moment. Static from the microphone made his words scratchy, but his emotion was clear, surrounded by his wife and their three young children. "I am overwhelmed," he said. Supporters chanted his name. "I want you to know as I said … this thing is not about me. It never has been and it never will be. This race is about every last single one of us," he said. He recounted his biography, and ran through his campaign issues: more funding for public education, stronger environmental protections, a living wage. "My name on the ballot is simply a vessel, is simply a name. But what is underneath that name is all the issues we care so deeply about," he said.